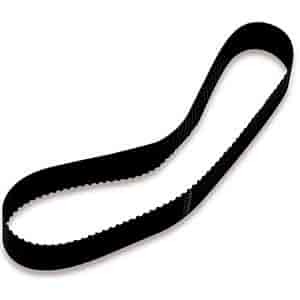 To find the correct length drive belt for your 6-71 or 8-71 supercharger, do the following: Add the number of teeth on your top and bottom pulley. Look in the belt chart below in the column under the engine you are using and find the number that equals the total teeth on your pulleys, then read to the left for the proper belt part number. (1) The belts listed are for WEIAND supercharger kits installed on a Chevrolet Big-Block tall deck with either a Weiand #8204 or #8206 manifold spacer kit or Weiand's new manifold #7152 (satin) or #7152P (polished). (2) 1/2'' pitch measurement is taken from center of one tooth to center of next.